Work is currently underway in IEHG to develop the Hospital Group into an Academic Health Science Centre in partnership with UCD. This will be done through collaboration across the traditional boundaries between education, health and scientific research to enable the discovery of innovative health improvements as well as providing care in new ways, with the objective to align and leverage expertise, innovation, reputation and performance to deliver improved health outcomes and patient experiences. Our focus through this transformation journey will be the pooling of resources and expertise in the first instance through the development of Clinical Academic Directorates across our hospitals to enable the development of world-class research in key areas such as cancer, ophthalmology, cardiology, women’s and children’s health. 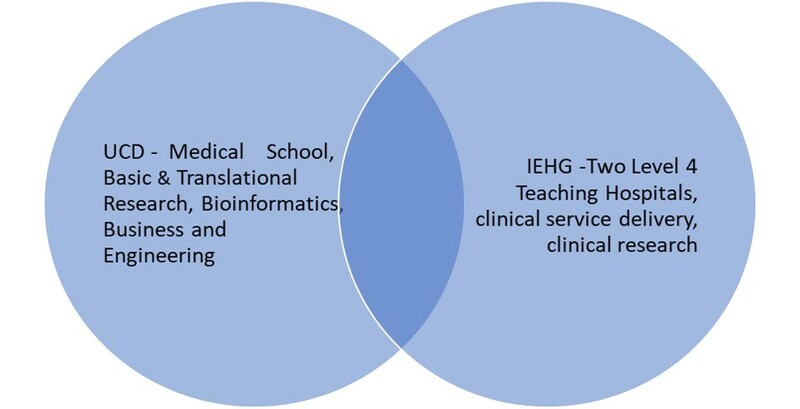 It is anticipated that building close partnerships between health practitioners and researchers will also enable new scientific discoveries to be translated more quickly into patient treatments and improved clinical outcomes. The Cancer Clinical Academic Directorate is the first Clinical Academic Directorate developed in the Ireland East Hospital Group and was launched in June 2016 by IEHG CEO Mary Day and the Director of the National Cancer Control Programme Dr Jerome Coffey. The aim of the Directorate is to align the two cancer centres at the Mater Misericordiae University Hospital and St. Vincent’s University Hospital into a single function operating across two sites which will combine the strength and scale of our clinical cancer services at both hospitals together with the cutting edge research of UCD to enhance the care given to cancer patients across our Group. Our staff are dedicated to improving the outcomes and experience for our patients with cancer by providing expert, compassionate care for every patient, every time. Clinicians from our hospitals have started working together in a formal structure, harnessing our significant academic and clinical expertise to enhance the delivery of patient care and improve outcomes.